Way back at the beginning of the year, we did what any good marketing blog would do. We put our writing on the line and attempted to predict what would happen in the coming year. Well…not too bad, actually. We said that content marketing would become commonplace (check), and that businesses would do well to become their own publishers (check), we also recommended that businesses create content strategies to help them manage and create all this wonderful material for their customers. How did your content do then? After the wild ride of Google’s updates this year, it seems that many people are feeling a little beaten down (but not out). I think this year is the year everything changes for Google. In what way, I can’t put my finger on right now, but it feels like something big is in the works for the search engine to beat all search engines… Hummingbird is just the start. If the folks at Forbes are correct, then 2014 is also the year when content marketing will become bigger than ever before. Like the SEO of yesteryear, if you aren’t creating really engaging content for your customers, you are losing out. How mobile-friendly is your content? What about your website? Email marketing to mobile? Are you even thinking about which device your customers are reading (consuming?) your content? If not, you’re going to find that 2014 is the year you need to do something with mobile. Those clever clogs at Forbes also report elsewhere that 87% of sales through online (i.e. connected) devices will be made with either tablets or/and smartphones. Well, there is no time like the present to get your content ready for next year. In fact, acting now is the best thing you could do. I could be flippant here and say ‘write some good content,’ but that wouldn’t do you much good now would it? Use a Copywriting Agency to Beef up Your Site’s ‘Thin’ Content – we summarise the words and deeds of Google’s chief spam guru Matt Cutts to help you understand why your content might be judged as ‘thin’ by the Google machine. Then, we help you think about how to ‘un-thin’ your content. Effective Storytelling for Brands – This is a great piece on Search Engine Watch; read it to understand what brand storytelling is and then keep reading to learn about how you can create a compelling story arc that your audience will love. 20 inspirational examples of product page copy – we write about product copywriting regularly on this blog, but we thought you might appreciate another perspective on this topic. 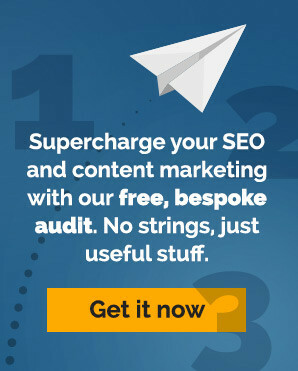 Read this Econsultancy post and be inspired to create your very own amazing product page copy. If you do anything in the coming year, please please please (I mean it) take content seriously. Learn about why you need to be creating it and think about how you can bring value to your customers and to the world. ‘Un-thin’!!? Surely ‘thicken’ would have been a better choice of word. You are after all, copywriters. It was a little tongue in cheek, hence the apostrophes. Great post Derryck. I agree with your point about people accessing content on tablets and smartphones. You’ve reminded me that I need to check my own website for accessibility on mobile devices. One trend that I predict from an SEO perspective is people searching for content using long tail keywords and fuller sentences thanks to voice recognition searches on smartphones. Everyone knows how tricky it can be typing on a tiny smartphone keyboard (as I’m having difficulty with right now) so I reckon 2014 could be the year that audible searching comes into its own. Good point Jamie – the signs are that this kind of search is going to be increasingly important and Google’s Hummingbird update is addressing this very point.